Chinese herbal expert Prof. Wang Zhen Guo researched more than 1,200 kinds of herbs and natural remedies. He devoted a total of 16 years in this endeavor. Afterwards, he was able to produce a new Anti-Cancer medicine, which can prolong and provide quality lives for patients. He has received international recognition for his work and numerous awards. He made his formula public, as well as actual trials and scientific explanations. The American Cancer Society holds scientific meetings annually. 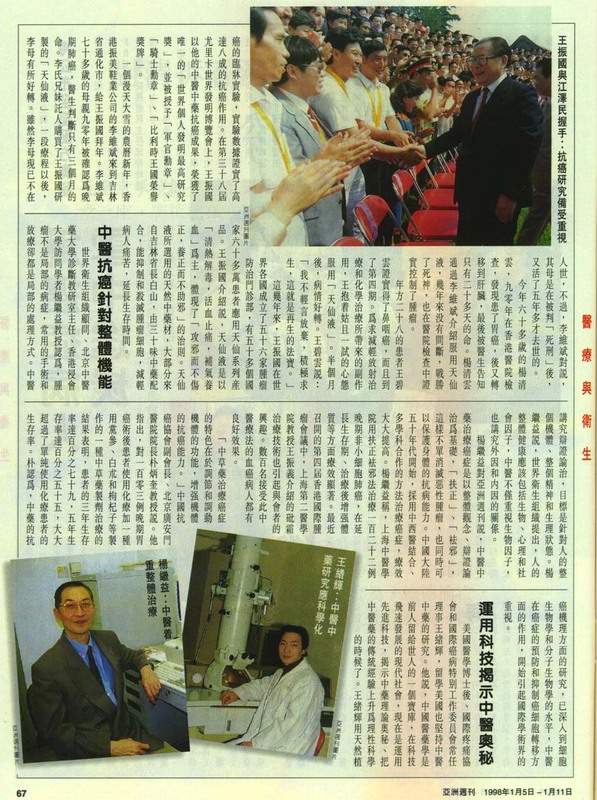 In its August 1997 meeting in Japan, it invited 12 internationally renowned cancer experts to hear Prof. Wang Zhen Guo’s talk on the effects of Chinese drugs on Cancer. This was their first in 20 years. Chinese Anti-Cancer Expert Wang Zhen Guo’s 90-minute speech and 12-slide presentation sparked the interest of more than 1,000 people. According to WHO figures, there are 4 million people globally who suffer from cancer. Annually, 900,000 new patients are diagnosed with cancer, and the number is on an upward trend. The annual death rate of cancer patients is about 10% of the total population’s annual deaths. Since the 1930s, international research on cancer has begun to flourish. The United States alone spends more than US$2 Billion annually on research and drugs. Wang Zhen Guo heads the “Tong Hua Changbaishan” Research Center in Jilin Province (China) as director. He visited a lot of places in China, and collected about 4,000 herbal remedies against cancer (secret formula handed down from generation to generation). He classified and listed the 1,200 kinds of herbs and studied them. Thus, he was able to produce the new drug called “Fu Fang Tian Xian Capsule.” It underwent several trials in numerous institutions, such as theTianjin Medical Institute, China Medicine Research Center, Kwang An Men Hospital, and 25 other centers. He personally supervised and studied the causes and curing effects on 807 actual cases. This study showed patients with much improved health and had an effectiveness rate of above 80 percent. In 1986, Fu Fang Tian Xian Capsule was included in China’s Scientific Committee, Health Department, and Drug Control Administration as an “important project.” In September 1988, the National Health Department approved its production after considerable laboratory tests on cells, mice and humans. They also applied and successfully obtained international patents in the United States during the same year. Beginning 1988, the U.S. National Cancer Center spent 3 years using Tian Xian Capsule (its name changed to Tian Xian Liquid later on) as the main medicine against 10 kinds of cancers in 48 laboratory cell experiments. The result confirmed its 80% anti-cancer effectiveness. During the 38th Eureka World’s Invention Expo, Wang Zhen Guo received the only “World Individual Invention Highest Award,” Knight medal, General medal and the Royal Belgium Honorary Award because of his accomplishments in developing Chinese drugs against cancer. In the 1990s, the septuagenarian mother of Lee Yi Pin of Hong Kong was diagnosed with terminal lung cancer and given 3 months to live. Lee’s children bought Tian Xian Liquid for their grandmother. After taking the medicine, her condition improved and she went on to live for another 5 years. In 1990, 60-year old Yang Ching Yin was diagnosed with stomach cancer and it later metastasized to the liver. The doctor told him he only had 20 days to live. Through the recommendation of Lee Yi Ping, Mr. Yang began taking the Tian Xian Liquid. Later, it was confirmed that his cancer was under control. Wang Zhen Guo has formed 56 cancer-prevention and diagnostic clinics. More than 600,000 patients in 50 countries have taken Tian Xian products. “Tian Xian Liquid removes body heat, is a toxin neutralizer, purifies blood, stops pain, supplements (energy) and regenerates blood” as its primary function. It destroys cancerous cells and does not harm good cells. It generates normal cell growth and inhibits proliferation of defective cells as its basic principle. Tian Xian uses natural herbs, most of them from Jilin Province Changbaishan. Tian Xian consists of 30 natural kinds of ingredients that control and destroy cancer cells, lessen patients’ pain, provide quality and longer lives. He has disclosed the secret formula of “Tian Xian Liquid.” The company requested the FRC Medical Biology Research Center of Taipei to study the Tian Xian Liquid scientifically. Ku Tiong Fong, the center’s director and oncology director, said, “The laboratory test is divided into 4 parts. The test was to determine the following: capacity to act as a free radical scavenger, toxicity to humans, immunity to new tumor cell and inhibiting power on cancer cell growth.” Trials were also conducted by the experts at Beijing China Science Center, Taipei Free Radicals Research Center, U.S. Fulbright Research Center and Guang Chou Tumor Hospital. After a year of research, the result is an 80% positive reaction. Ku Tiong Fong believes Tian Xian Liquid is a very promising Anti-Cancer product, and suggested continuing improvement. These actual experiments required divulging the secrets to the public, said General Manager Wu Chun Teh. But this could spawn copycats. There are already 10 counterfeit kinds of Tian Xian Liquid found in Hong Kong, Japan, and Thailand. These fake products endanger the lives of the patients. Wu said, “For the past few years, the advertising costs to warn the public about these fake products” has reached HK$10 Million. Wang Zhen Guo already made public the 28 of the 30 ingredients, and hopes to reveal all of it in the near future, according to Asiaweek. He hopes to use modern scientific technology to unlock Chinese drug secrets. The International Cancer Rehabilitation Association offers a helping hand to restore confidence and success in winning the war against cancer. The group has supported more than 1,000 patients and families. One such recipient was Chen Yeh Wu, who discovered a peanut-size lump in her throat at the age of 28. It was later diagnosed to be cancer. The cancer had spread to the lymphatic system. She began to take “Tian Xian Liquid,” provided for free by the association based on her finances. After several dosages of the liquid, Miss Chen’s condition improved. 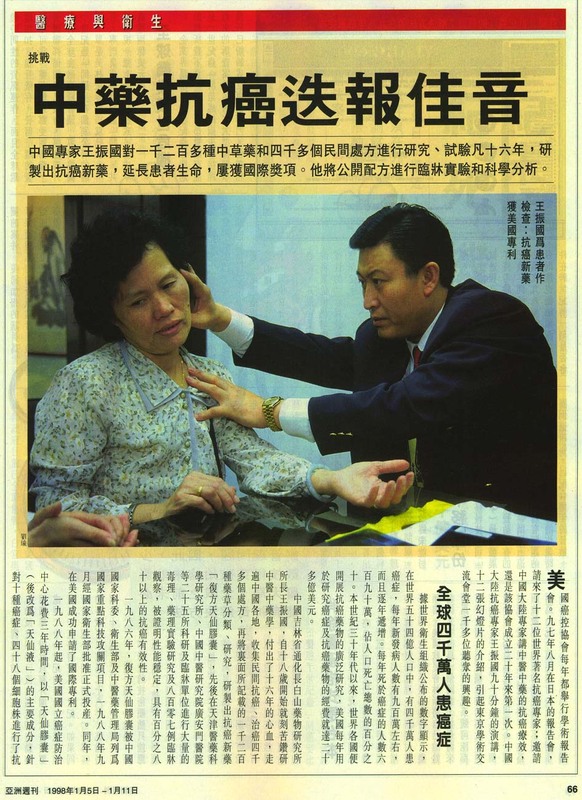 Chairman Lu Ji Wei’s own mother was also a cancer patient. A lung cancer patient given 3 months to live, Lu gave her “Tian Xian Liquid” to lessen the pain. She went on to live for another 1.5 years before passing away — but not from cancer. The cause of her death was the weakening of the heart beat due to diabetes mellitus complications. Mr. Lu, together with some friends, used the name of International Cancer Rehabilitation to form a foundation to help those who are fighting cancer. They embarked on cancer treatment missions. 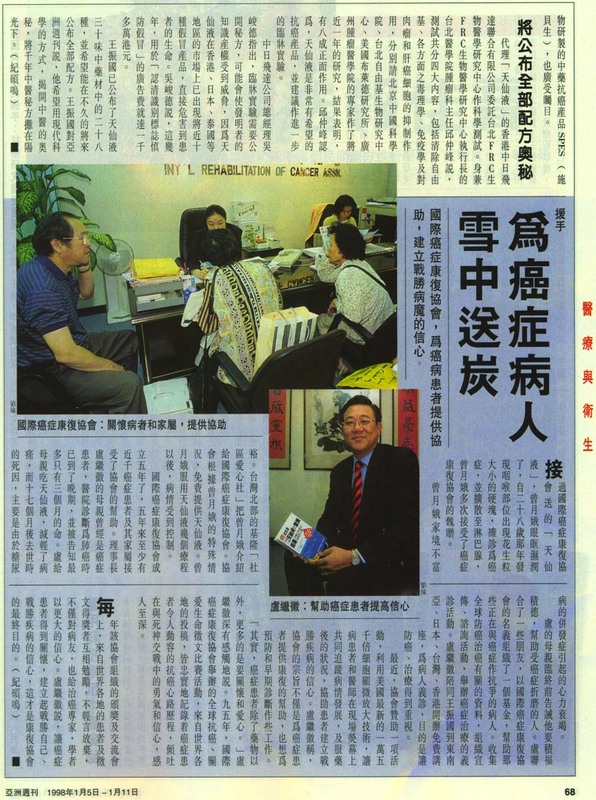 Mr. Lu accompanied Professor Wang throughout Southeast Asia, to Japan, Taiwan and Hong Kong, to give free lectures and free consultations. The purpose was to promote awareness of cancer prevention and educate the public on the symptoms for early detection and early successful treatment.